Hotels, resorts, and guesthouse owners have been hit the hardest last year. According to Tourism Council of Bhutan (TCB), more than 11,000 tourists visited Bumthang last year. However, hoteliers said only more than half of the mentioned figure came there. They added TCB might have excluded the number of tourists who cancelled their trips halfway. The number of tourists visiting Jakar Dzong over the last few years also declined. From this month, it is a peak tourist season in the country. But in Bumthang, not many tourists are spotted. This has been attributed to widening works of East-West highway, which starts from Simtokha- Trashigang. Irked by awful road condition, tourists cancel their trips on several occasions added the hoteliers. “Usually it takes just about 8 hours for tourist to reach here from Thimphu but after rehabilitation works started along the highway, the journey took 13 hour long and this was tiring at same time frustrating for the tourists. Since then tourist arrival has decreased drastically,” said Tandin Dorjee, the Chairperson of Family Run Hotel Association in Bumthang. Others too said initially tourists would include Bumthang in their itinerary but after knowing about terrible road condition, they cancel the visits. “Due to rusty, uneven and muddy highway, most tourists go back from Gangtey or Punakha. Those who visit here complain a lot about bad road condition. Last year, tourists stay in our hotel decreased by 80 per cent,” added Pema Norbu, the owner of hotel Ugyen Ling. Hoteliers are worried their business might face similar fate this year as well. “Contrary to 2013 and 2014, tourist arrival dropped drastically in 2016 and 2017. Moreover tour operators might not do much promotion for Bumthang as the road condition is bad,” told Tandin Dorjee to BBS. With the East-West highway widening project due for completion this year, hotel owners there are hopeful their businesses will resurge by next year. 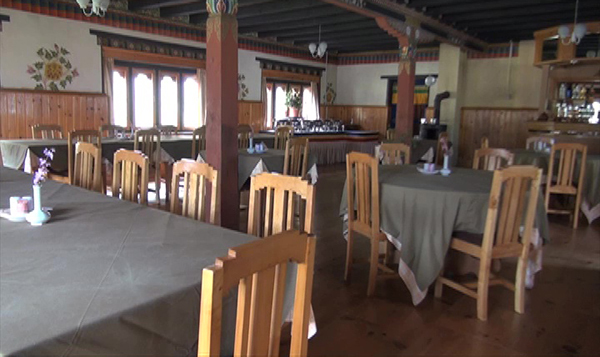 There are currently 45 tourist hotels and resorts in Bumthang- one of the top tourist destinations in the country for its famed historical sites and festivals.